Posted by Kim Ciuffreda on Monday, August 8th, 2016 at 1:52pm. There’s a ton of terrific, true, and essential home improvement advice out there. “Measure twice, cut once” comes to mind. Ditto “Pick remodeling projects with the best ROI.” But “Screw contractors, do it all yourself”? Not so much. Bottom line: There’s some very, very bad advice out there, fighting for attention along with the good. And much of this misdirection may actually be trotted out by friends and family who mean well. Unfortunately, good intentions won’t keep your home from becoming seriously messed up. 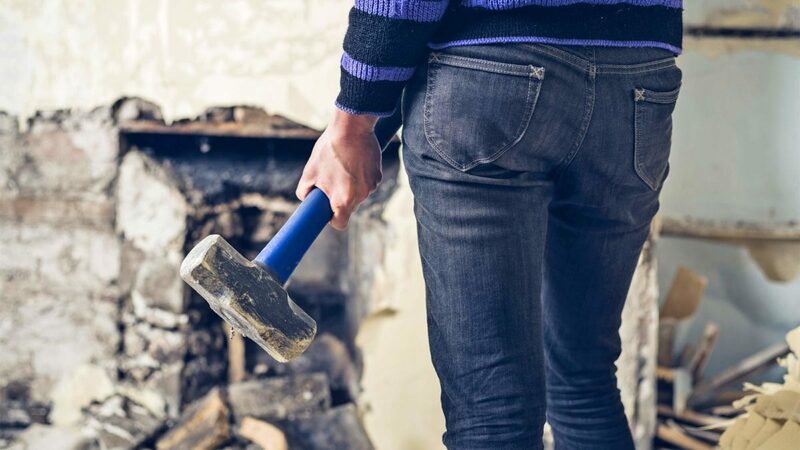 So before you pick up a hammer, make sure to check this list of the worst home renovation advice you might be tempted to try. Then slowly back away from the toolkit and think twice! Maybe even three times. Why you might hear this: That half-wall into the dining room is just that: half a wall. Tearing it down seems like a cheap and easy way to open up tons of space. They do it on “Property Brothers” all the time! Like, every week! Why it’s bad advice: Some walls may not look it, but they are indeed structural, meaning they’re holding up the floors or framework above. And what’s in those walls—electric and plumbing—can make ripping into one on par with opening a vat of Maori eels. Why you might hear this: If a home improvement design is in vogue, it must be good—and could boost your home’s value if you’re looking to sell. Why it’s bad advice: Just because something is popular doesn’t mean it’s appropriate for your needs. Be open to input. Just “never let anyone talk you into a renovation that you really don’t want or don’t like,” says designer Pablo Solomon of Austin, TX. Why you might hear this: If a house is historic, it’s bound to feel stuffy and old-fashioned unless you do a 100% rehab. Why it’s bad advice: Eliminating the historic appeal or character of a home—think tearing out original woodwork, built-ins, and claw-foot bathtubs—is one of the worst things you can do, according to Realtor® Matt Forcum with Century 21 Realty Concepts in Effingham, IL. While completely updating an older home may appeal to certain homeowners, those changes may result in a house whose interior style doesn’t match the exterior, or that doesn’t match the character of the neighborhood. This makes it “a market outlier” and might drag down the value of the property and the speed of sale. Why you might hear this: Your hardwood floors look like a Louisville slugger after the World Series. Putting down laminate or wall-to-wall carpeting is an inexpensive fix. Why it’s bad advice: “Unless you’ve had significant water damage, it doesn’t take much to replace hardwood flooring,” says Luis Leonzo with TableLegsOnline.com. And ripping out old floors may actually lower the value of your house. Why you might hear this: Hey, whatever costs the most is the very best. Why it’s bad advice: While some pricey new countertops can improve a home’s value, outrageously expensive renovations will rarely pay off, according to Morgan Franklin of United Real Estate Lexington in Kentucky. Instead, Franklin suggests finding nice granite for $35 to $50 instead of marble that would run $100-plus a square foot. “In the eyes of the appraiser and the next buyer, there isn’t much difference,” Franklin says. Bottom line: When considering upgrades to a home you plan to sell in the future, understand what value the market places on those upgrades. Why you might hear this: You know what you like. Besides, it’s your home and your money. Why it’s bad advice: Sure, in some cases you can renovate however you see fit, but it’s far wiser to understand the pros, cons, and realistic costs of each renovation you want to undertake. Too often “people don’t research the facts as to what renovations actually will pay off in a higher resale value for their home,” says Solomon. Why you might hear this: You’ve watched a ton of HGTV, right? And so you pretty much understand everything from framing to finishing.